A dog carrying food crossed a bridge and sees its reflection. Wanting the reflection’s food the dog drops his. Ooops. If you covet all, you may lose all. A Dog was carrying a piece of meat in his mouth to eat it in peace at home. On his way he had to cross a bridge across a brook. 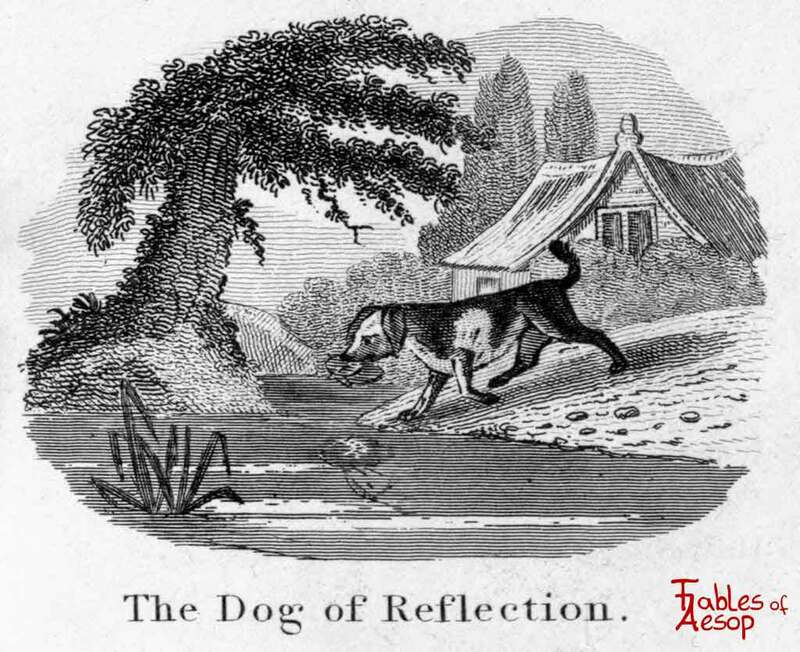 As he crossed, he looked down and saw his own reflection in the water. Thinking it was another dog with another piece of meat, he made up his mind to have that also. 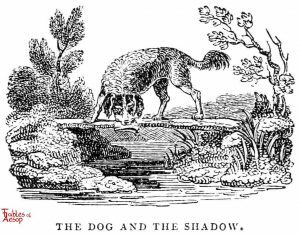 So he made a snap at the shadow in the water, but as he opened his mouth the piece of meat fell out, dropped into the water and was lost. 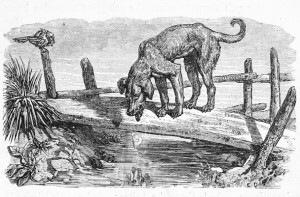 A Dog, crossing a bridge over a stream with a piece of flesh in his mouth, saw his own shadow in the water and took it for that of another Dog, with a piece of meat double his own in size. He immediately let go of his own, and fiercely attacked the other Dog to get his larger piece from him. 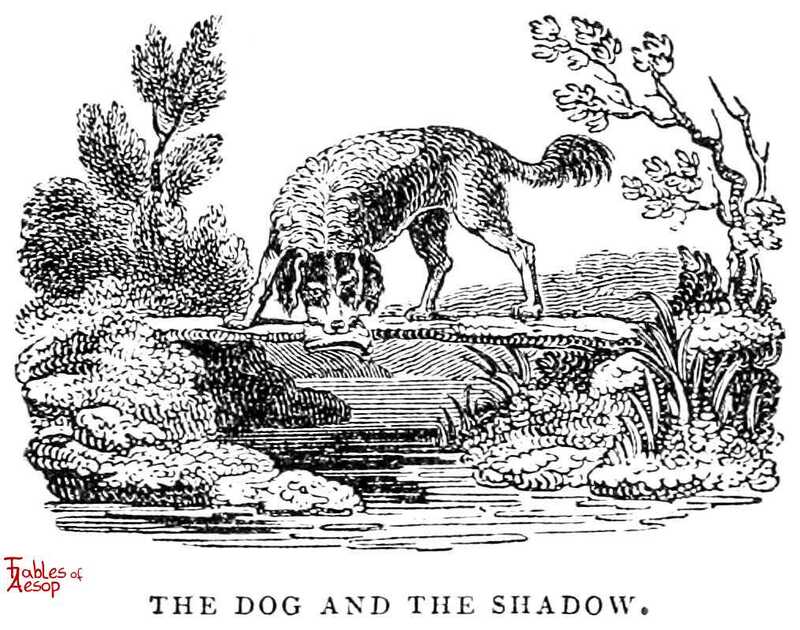 He thus lost both: that which he grasped at in the water, because it was a shadow; and his own, because the stream swept it away. Thought the cur as he trotted away. Not dreaming of danger or loss. Had run off in that very direction. He slowly walk’d home to his kennel. The good that we have in possession. 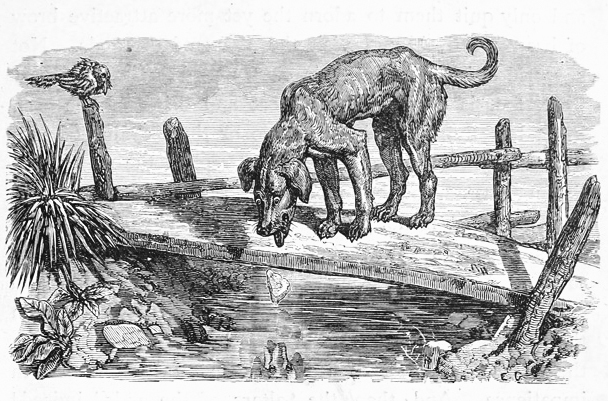 A Dog, bearing in his mouth a piece of meat that he had stolen, was crossing a smooth stream by means of a plank. 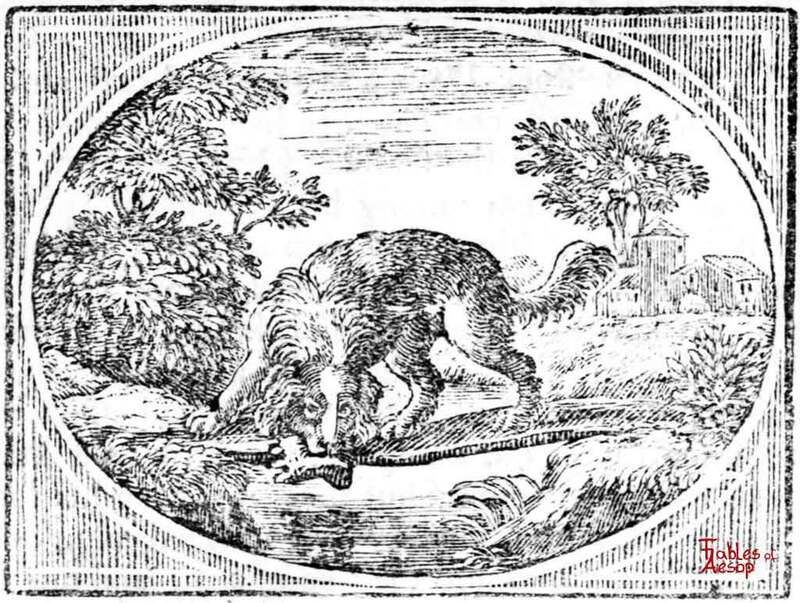 Looking in, he saw what he took to be another dog carrying another piece of meat. Snapping greedily to get this as well, he let go the meat that he had, and lost it in the stream. 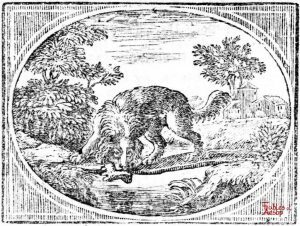 A DOG, crossing a little rivulet, with a piece of flesh in his mouth, saw his own shadow represented in the clear mirror of the limpid stream; and believing it to be another Dog, who was carrying another piece of flesh, he could not forbear catching at it; but was so far from getting any thing by his greedy design, that he dropt the piece he had in his mouth, which immediately sunk to the bottom; and was irrecoverably lost. He that catches at more than belongs to him, justly deserves to lose what he has. Yet nothing is more common, at the same time more pernicious, than this selfish principle. It prevails, from the king to the peasant; and all orders and degrees of men are, more or less, infected with it. Great monarchs have been drawn in, by this greedy humour, to grasp at the dominions of their neighbours; not that they wanted any thing more to feed their luxury, but to gratify their insatiable, appetite for vain-glory. If the kings of Persia could have been contented with their own vast territories, they had not lost all Asia for the sake of a little petty state of Greece. And France, with all its glory, had, ere now, been reduced to the last extremity, by the same unjust encroachments. He that thinks he sees another’s estate in a pack of cards, or a box and dice, and ventures his own in the pursuit of it, should not repine if he finds himself a beggar in the end. 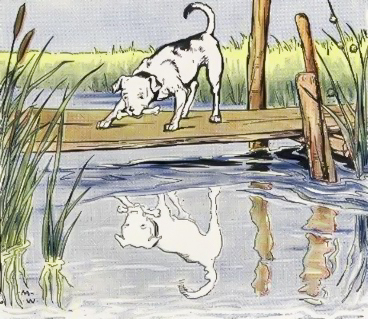 As a dog was crossing a river, with a morsel of good flesh in his mouth, he saw (as he thought) another dog under the water, upon the very same adventure. 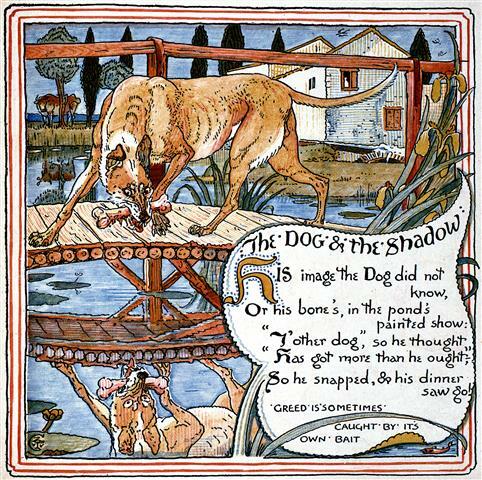 He never consider’d that the one was only the image of the other; but out of a greediness to get both, he chops at the shadow, and loses the substance. All covet, all lose; which may serve for a reproof to those that govern their lives by fancy and appetite, without consulting the honor, and the justice of the case. Greed is sometimes caught by its own bait.